Best Folding Kayak – Should you get one? But we’ll have to warn you that purchasing one is no easy task considering the number of folding kayaks on the market. And chances are most manufacturers will be claiming that their products are better than the rest. This makes it very difficult to decide on which brand to pick. That’s why we’ve decided to give you some pointers to help make the right purchase. Where to Buy Your Kayak? Why Pick a Foldable Kayak? Ideally, the folding kayak you buy must be of the highest quality and not a disappoint where performance & durability are concerned. If a high-performance kayak is what you’re after, then consider buying from Oru. This manufacturer is the premium folding kayak maker currently trusted by many water sports enthusiasts. Ever since 2012, Oru has been in the business of constructing high-quality folding kayaks. Note that owning an Oru kayak doesn’t come cheap because its products are rather pricy compared to their competitors. But for the quality, performance, and durability on offer, we think they’re worth every penny. After all, most people prefer to purchase kayaks as a one-off investment so they may be willing to spend a little extra to get quality one. But not all of them are expensive. If you really want a high-performance kayak but are working on a budget, then you can consider purchasing from Tucktek. This manufacturer is known as one of the leading manufacturers of reasonably priced kayaks. And the best part is the low price doesn’t necessarily mean you’ll be getting a low-quality product. Actually, Tucktek is known for manufacturing & designing high performance and durable folding kayaks. Foldable kayaks can be used for most water adventures, be it fishing or sailing. You only have to make sure you purchase one that’s specifically designed for the intended purpose. Does it have enough storage space to store your gear or the fish you catch? Think about that before buying one to avoid disappointment. Make sure it suits your requirements. The weight limit on a folding kayak will differ from one brand to the next. Some of the larger models have a 300lb weight capacity which is rather impressive. You might be wondering why you must pick a folding kayak over a regular or inflatable one. After all, inflatable kayaks are also portable, right? And not forgetting the fact that the foldable kayak is far from being the cheapest of the three. So why opt for the most expensive option? We’ll list a few reasons that may justify the high prices and explain why foldable kayaks are better options compared to the other types. If you want to have a small boat on your sailboat or pontoon for a quick excursion. Consider how impossible it is to carry a long kayak up the stairs or into an elevator. Do you have a small car? You’ll realize that it works out better to transport the kayak in your car as opposed to loading it on the roof. Thanks to folding kayaks you can transport your kayak almost anywhere no matter the size of your vehicle. Because these kayaks are collapsible storing them will be a breeze. You certainly won’t find storing a full-sized kayak in your backyard or storeroom easy. It’s more likely to take up a lot of space and obstruct movement depending on where you place it. So why not opt for a collapsible kayak for added storage convenience? Still, on the subject of convenience, you don’t have to worry about constantly inflating or deflating a foldable kayak. This is obviously something you have to do constantly with an inflatable kayak and that’s time-consuming. We not only love a folding kayak for its space saving design. We’ll have you know that most of them are constructed using very tough and durable frames. As a result, you can expect your folding kayak to last your for many seasons of fun on the water. Most folding kayaks are strong enough to withstand accidental falls; for example, falling from your car roof rack to the cement floor. Kayak manufacturers understand the harsh environments that you’ll be using these units in. That’s why they make them strong enough to handle such scenarios; for instance, sliding over sharp rocks in shallow water. Unfortunately the same can’t be said about inflatable kayaks. The material used in their construction is unlikely to withstand harsh water environments and obstacles. Most inflatable kayaks contain woven fabrics that are either coated with rubber or plastic. Though the plastic may be strong, it doesn’t compare to the rigid frames that make up most foldable kayaks. Inflatable kayaks are simply not as sturdy as their foldable counterparts. As mentioned earlier, Tucktec kayaks are your ultimate go to if you want a quality but relatively inexpensive kayak. The low price has no bearing whatsoever on the quality and performance of this folding kayak. This full-size folding kayak is known for its rigid and solid frame. And thanks to its folding design, you can store it almost anywhere with ease. Whether you want to store it in the back seat or trunk of your car, you can do so hassle-free. The Tucktek kayak is available in a standard size and it’s around 10ft long. When collapsed it literally folds down to only 48”. This kayak isn’t heavy at all and weighs less than 30lb. With regards to performance, it’s a fully functional kayak that comes with a number of impressive features. First off, the hard shell design is constructed using premium materials and detailed craftsmanship making it a very solid unit. Whether you’re a camper or fisherman, you’re bound to appreciate this folding kayak because of its versatility. Setting it up from its folded position is pretty fast and simple. The whole process will take you less than two minutes, and you don’t need any extra tools for the job. It helps that the kayak comes with a set of easy instructions to aid in the setup process. After use, folding down the unit is also simple which you’ll appreciate if you’re in a hurry to get home. As mentioned before regarding the price of Oru kayaks, this is certainly not the cheapest kayak on the market. But we can assure you that it’s one of the lightest. Compared to the Tucktek folding kayak reviewed above which weighs 30lb, this model weighs only 26lb. But because it’s very light, strong winds are likely to blow it off course. Remember that before venturing out into windy conditions. 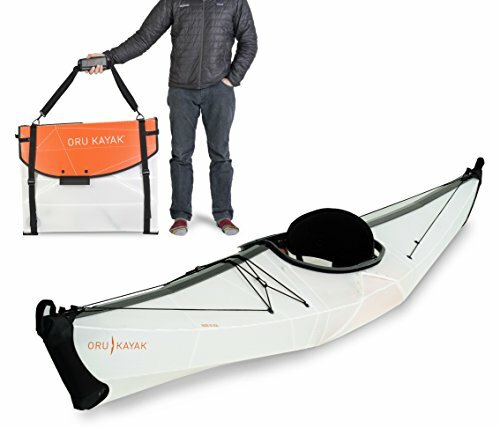 Unlike the Tucktek kayak which is 48” long when folded, this Oru kayak is 28” long making it super portable. This makes it easy to store and transport almost anywhere. This kayak is known as one of the world’s easiest collapsible boats and like the Tucktek kayak, it won’t take you much time to set up. You can have it up and running in a little over three minutes which isn’t bad at all. This is the ideal kayak to pick if you’re planning on going for a casual paddle on calm waters. 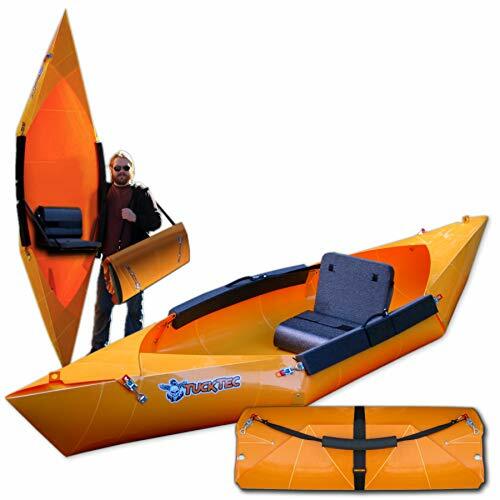 Expert kayakers who want to go out on the water but do not want to worry about transporting or storing their kayak because of space limitations love this kayak as well. That’s how versatile this model is. Because it can handle up to 300lbs, it’s ideal for almost everyone. And thanks to its stability, you don’t have to worry about capsizing during your water adventures. The cockpit on this model is reasonably large which makes entry and exit a breeze for most paddlers. And it has plenty of room to store your gear and equipment. With regards to durability, the hull is made of custom polypropylene which has a 10 year UV treatment. This means it’s one of the strongest kayaks you’ll find. Looking for a high-performance kayak? Look no further than this BayST folding kayak that we’ve rated the best sport folding kayak on our list. But note that it’s also the most expensive kayak on our list of recommendations. 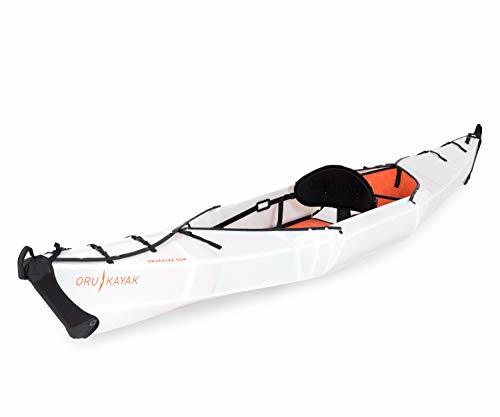 Like the Oru kayak reviewed above, this model also weighs around 26lb. And it folds down to 29” making it compact for easy storage. It has the same weight capacity of 300lb and has ample storage space. This means you can store the necessities with ease. 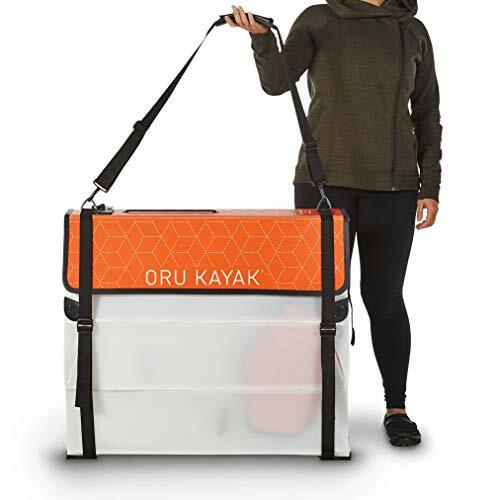 Most of the features on this model are more or less the same as the Oru reviewed above, including the fact that the exterior is made from UV treated polypropylene. But the most notable difference would be that it features a new design which makes the kayak even easier to assemble than the model reviewed above. The other difference is that this model is specifically designed for fast and sporty water activities. This is thanks to its length and contouring which makes it the ideal pick for expert kayakers. Stability is guaranteed if you pick this folding kayak. Even a 3ft wave is unlikely to capsize it. A major drawback you have to deal with is the fact that the seat cushion doesn’t have enough padding. While you may not feel the discomfort immediately, you’re bound to after a few hours of paddling. But it’s nothing extra padding can’t fix. Also, this might not be the right pick for you if you’re on the taller side because it doesn’t have much leg room. But overall, the kayak performs well. Do Oru kayaks have skegs? No, Oru kayaks don’t come with skegs. Does the Tucktek kayak have a skeg? Yes, Tucktek kayaks do have skegs. What class waters can folding kayaks be used in? Ideally, folding kayaks can be used in up to class two waters and we wouldn’t recommend venturing with them into waters higher than that. Is there more storage space in folding kayaks? No. 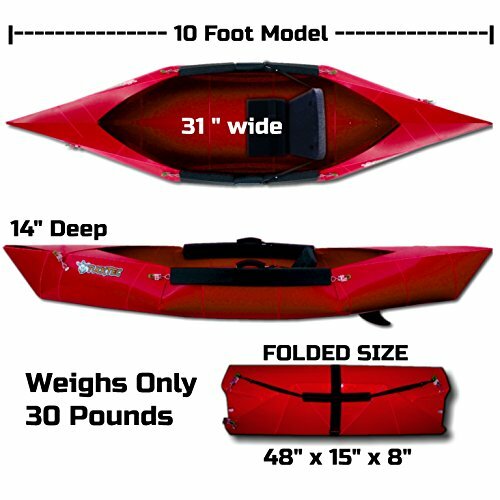 When compared to other types, folding kayaks don’t have much storage space. This is because they’re made to be as small as possible. Do folding kayaks come with a paddle? Unfortunately, folding kayaks don’t come with paddles. But this isn’t really a deal breaker because a paddle can be purchased elsewhere and there are many cheap models available. It’s clear how the foldable kayak will make your life much easier during your outdoor adventures. These units are designed to minimize prep time so that you can focus on the water activities at hand. Based on the above information, would you consider owning one? For the convenience these kayaks bring, all water sports lovers should try one out. 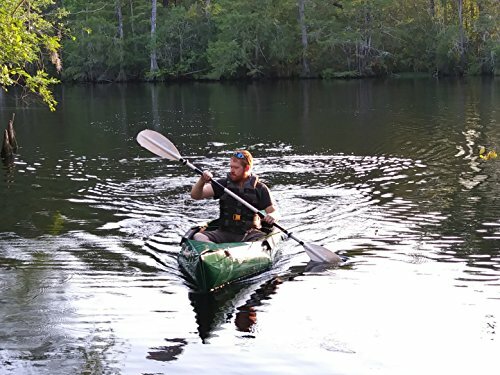 Bestfishingkayak.net is a participant in the Amazon Services LLC Associates Program, an affiliate advertising program designed to provide a means for sites to earn advertising fees by advertising and linking to amazon.com. Copyright text 2019 by BestFishingKayak.net.